Have a happy scrapping day. May I inspire you to create something wonderful. Just-A-Scrappin' July 31,2014 Challenge is using the color Silver to create notations. Make a cards, layouts, 3D projects or altered art. All embellishments, paper and card stock is from my stash so I do not have all the names of the companies. 1. Handmade Ric-rac Flowers: Materials used Wrights metallic Silver 1/4" Wide Ric-Rac, Needle and Thread. 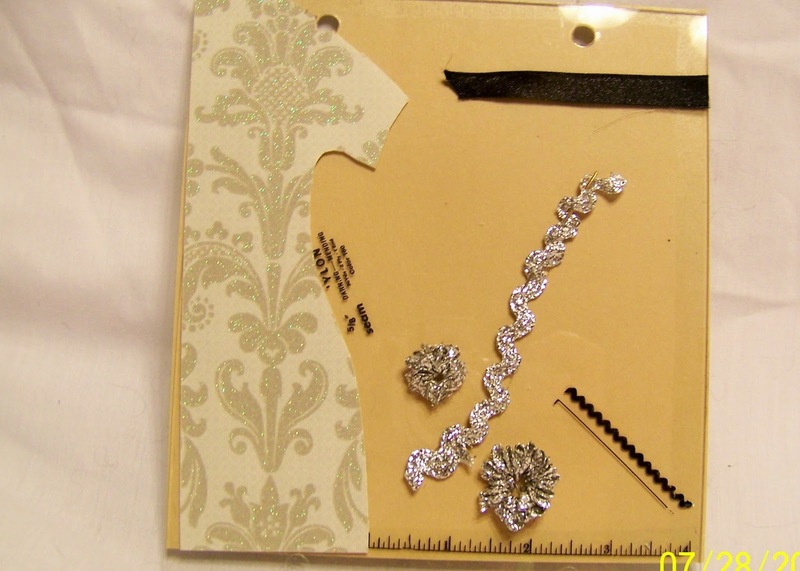 To make the flower, lay out about 12" of the silver ric-rac. Using needle and thread, sew a running stitch through the ric-rac. Pull on thread until ric-rac bunches up. Pinch the bunch into a circle so that the bumps look like flower petals, and sew into place. 2. I'm using 7gypsies Hanging Book album in clear acrylic for myself. I cut a dress from silver and gray paper and adhered with Tombow permanent adhesive. 3. Using Glue Dots I placed the handmade flowers, the silver Ric-Rac, and needle to the page. 4. Added 7gypsies Elements in black and the black ribbon. 5. Added the background by covering the back of the clear acrylic page.